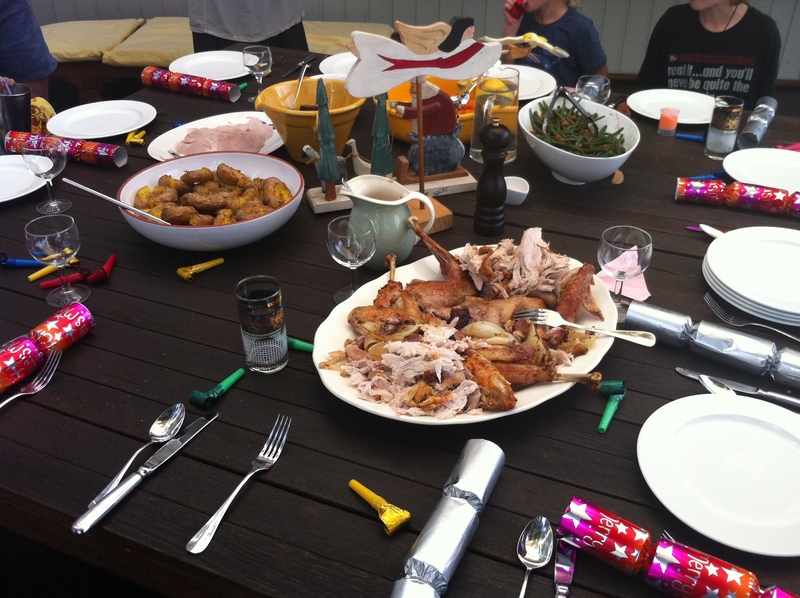 I have an article up on The Hoopla today: Happy ‘Free Range’ Christmas. In it, I detail the certification standards around free-range meat in Australia, and give suggestions about which ones to trust and where to source ethically-produced poultry and pork, plus some advice and links on sustainable seafood. There are more retailers and promoters of ethical and local produce than I had space for in the article, so I thought I’d put a few more here. Not all produce listed by these sites will necessarily be free-range meats – I’ve included local directories here, and you’ll need to do your own local homework on the details! I’d be very interested in feedback on more sites – I’ll pop them into the following list as I’m made aware of more. I was recently asked to peer review an article about gender and food preparation, and it brought me back to an old pet peeve when it posited ‘food prep’ as separate from ‘leisure time’. I’ve written about this before in a variety of ways, but the central point for me is that cooking is leisure sometimes, and when it’s arguably not, that is, even when you simply have to get dinner on the table after a long day, it can still be a very pleasurable activity if that’s how you frame it. Banal activities are too often framed as ‘chores’, ‘exhausting’, ‘tedious’ or even ‘hard’. While I reckon not many people love vacuuming (though I know some who do), cooking has all the ingredients to be anything but boring or a chore. It’s a creative process, it’s nurturing, it can require dexterity and finger memory, linking one to family traditions and far flung places once visited. 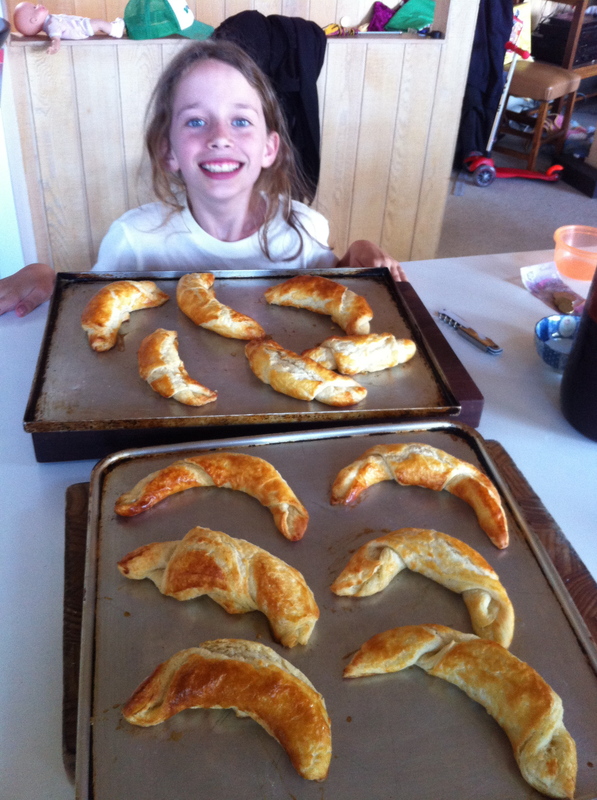 To reject cooking as leisure or pleasure is a life sentence of perceived drudgery. What a waste it is not to take pleasure from something most of us need to do every day of our lives. This brings me to the summer holiday we’re on at the moment down at Stuart’s family’s beach house. We gathered here for Christmas with the family, and all up we have been eight grown ups and five children. Summers here are always full of good food and wine, with a heavy emphasis on seafood. This year I arrived with a clear desire to cook myself back into a homely space after a very busy year that saw me interstate constantly for work. And cook I have! I actually feel a bit guilty at my total dominance of the kitchen, and only hope I haven’t kept anyone else from cooking when they really wanted to (though they assure me they’ve been happy with the constant stream of dishes…). I’ve barely even sat down to read for a week, as my mind constantly ticks over what ingredients are in the fridge, formulating new combinations even as the last meal digests. It started moments after we arrived, when I learned that a family friend who traditionally gives us loads of prawns, crayfish, mangos and cherries had in fact come through with the noms (though we got lychees instead of cherries as I understand this year’s harvest was destroyed by the floods – I wish all the farmers out there better luck next season, and hope the disaster wasn’t too debilitating for you). 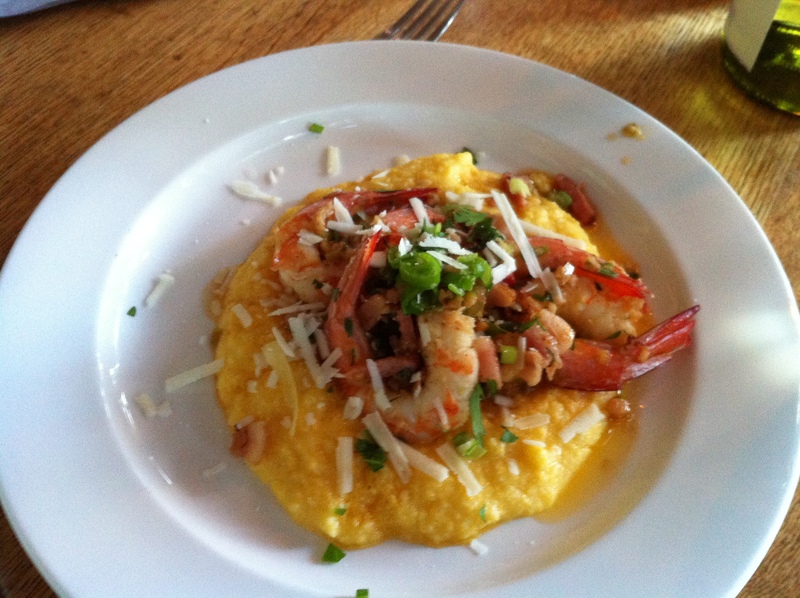 Immediately ‘shrimp and grits’, which I so enjoyed in Mississippi last year and have made a couple of times since, sprung to mind. I had polenta (grits being rather hard to come by in Oz), a selection of lovely cheeses (I used an aged cheddar and pecorino) for the ‘cheese grits’, and a beautiful eye of Fernleigh Farms free range bacon. A hint of cayenne pepper, plenty of garlic, the prawns and a garnish of spring onion finish the dish off. Christmas Eve it was time to play with the crayfish. With a decadent half a cray each, obviously I needed to make aïoli. 🙂 Some small sourdough rolls made from leftover pizza dough (which were actually like little stones, oops! ), lightly steamed asparagus and a fresh salad was the perfect dinner the day before the real feasting would begin. We concluded dinner with a fabulous round of D’Affinois provided by my generous father in law, who is renowned for his excellent choice of sensational cheeses. Lucky us! We had two small turkeys (only about 3kg each) – one free range from Birregurra and one conventional turkey, which was a lot plumper than the rather lean organic one. I did two different styles – one the way my American brother in law shared with me from Thanksgiving, and the other roughly following what I remember of Stephanie Alexander’s that I’ve been making for years. My version of the recipe from Gary involved cooking at a high temperature (220C) for about 45 minutes with no stuffing under an aluminium foil tent, then out of the foil at 200C. It produced hardly any juices and was a bit dry, but still tasty with the onion, garlic, olive oil, butter under the skin, salt and pepper. The other turkey goes in at about 210C on its side with a stuffing I made from onion, garlic, free range bacon, bread crumbs, red wine, parsley, thyme, salt and pepper. After 15 minutes you flip it onto its other side for another 15 minutes, before popping it on its back at about 195C for the final hour. It was totally delicious, as was that stuffing. In fact, I reckon I’d be happy to just eat stuffing for Christmas dinner every year. For sides I did green beans with toasted almonds and a balsamic reduction, roast beetroot with feta and pepper, smashed potatoes with rosemary, salt and pepper, and someone threw together a simple roast pumpkin. And of course there was a huge free range ham that we’re still enjoying in many forms. Boxing Day lunch was a very simple affair of ham and fresh bread with a coleslaw made of cabbage, capsicum, spring onion & Stuart’s olives, dressed with more aïoli and the leftover balsamic reduction. 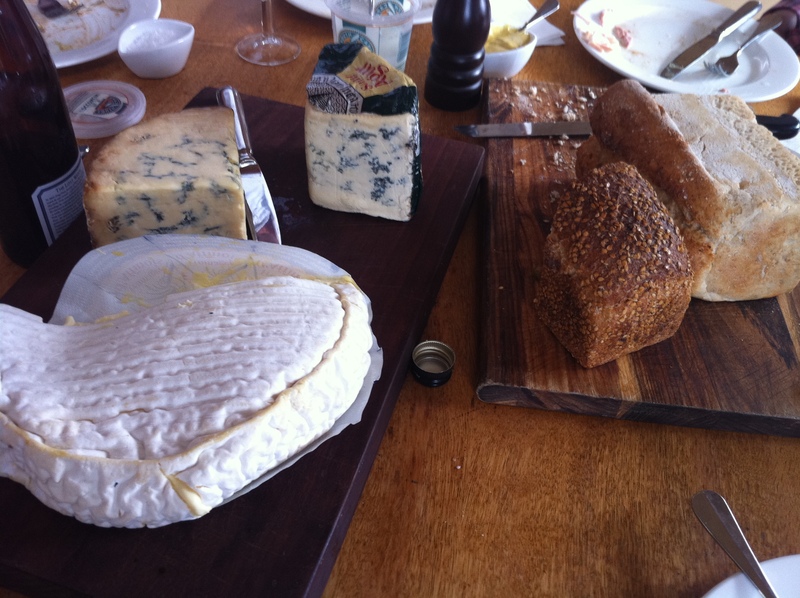 Wayne brought out the D’Affinois again, as well as a lovely English Stilton and a Saint Agur – in the war of the French and English, I reckon the French win in the soft cheese department. 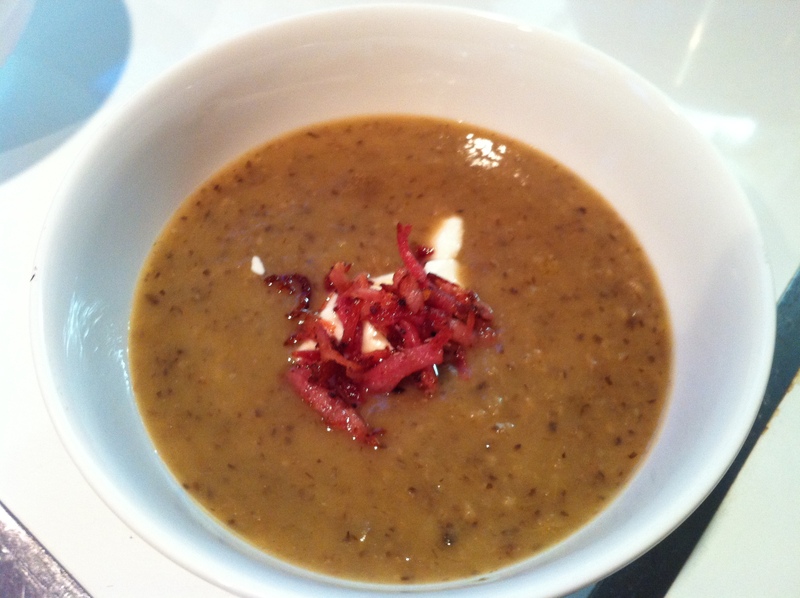 For dinner that night I was inspired by a recipe in one of Stefano Manfredi’s cookbooks, Seasonal Italian Favourites, to make a parsnip soup with the lovely turkey stock from the day before. Parsnip, leeks, garlic, Swiss brown mushrooms and a few potatoes made a glorious soup, topped off with a dollop of yoghurt and a few fried slivers of the ham, served with a fresh loaf of sourdough and luscious Lurpak butter. 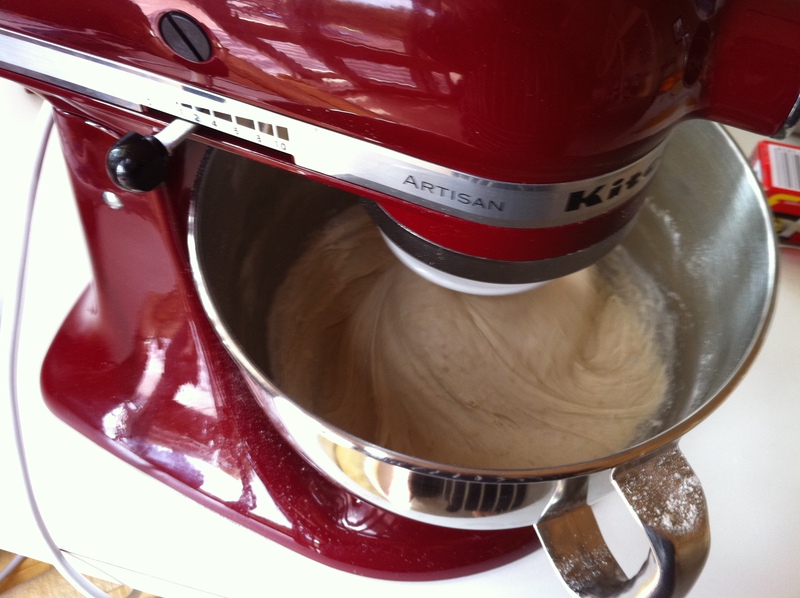 My KitchenAid also inspired me to attempt croissants for the first time, which is rather hilarious as the mixer is only useful for the initial kneading, and after that, all the fiddly work is manual. Fiddly it was, but I was pleased with the results of my first attempt. Antigone helped me roll them and reckons next time we should roll them out thinner and then do a looser roll – and I think she is exactly right, the clever girl! For breakfast the next day I did a simple omelette with the ham, tomato and mozzarella, served with another fresh loaf of sourdough, which I’m finally working out how to give a chewy crumb. I’ve been adding too much starter, I think, creating too acidic an environment to get strong gluten, so I’ve reduced the amount and kept to minimal kneading and long proving times (usually overnight). Thanks to Steve and Collette for your advice on the twitterz! 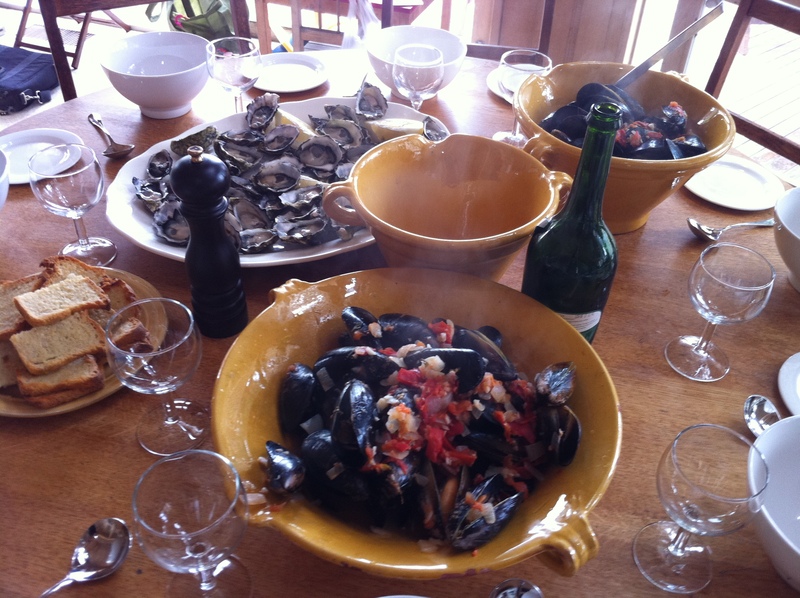 Lunch was inspired by a visit to the local fish shop, where we found Coffin Bay oysters and local mussels. Obviously this called for a simple Provençal style mussels as we had loads of gorgeous tomatoes asking to be eaten up. Onion, garlic, tomatoes, white wine and a hint of basil, served with sourdough sliced, coated with garlic and olive oil and toasted into crostini. Mollusc heaven! 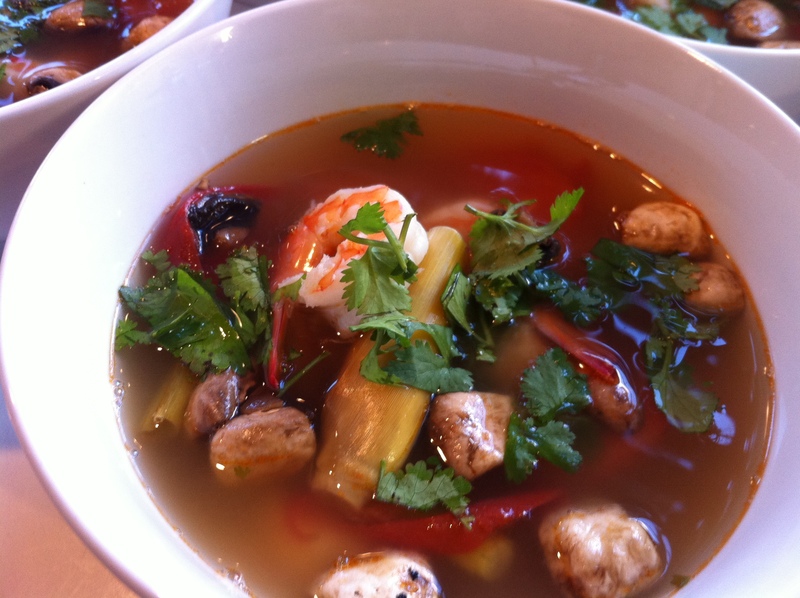 My last effort was to finish off the kilos of prawns, so I made a tom yum goong last night. I had a quick look at the Gourmet Forager’s post on David Thompson’s recipe from Thai Street Food, and adapted it to what I had to work with. Inspired by Stuart’s desire to make a prawn stock with all the heads from our copious bounty, I fried off of the heads and skin briefly, then added water and coriander roots and brought it to the boil. After 15 minutes I strained it out and there was my base stock. I also grabbed the final leg of turkey and made a small stock with the bones & gristle, plus some celery in want of using. I only had it on for about an hour and a half, but it still contributed to deepening the flavour of the prawn stock, which would otherwise have been a bit insipid. Into the stock went a bit of sugar, then bruised slices of galangal, lemongrass, lime skin (I didn’t have kaffir lime leaves) and chilies. Once I got the piquancy of the chilies, I added quartered mushrooms and tomatoes and cooked for about five minutes, before adding some of the delectable Phu Quoc fish sauce I hauled back from Vietnam and lime juice. A few little flavour adjustments to ensure I had the sweet, salty, spicy, sour combo right, and then I threw in the pre-cooked prawns just long enough to heat them through before serving topped with coriander leaves. I cannot explain how happy I was with the result of this soup!! Years of cooking and paying attention has finally paid off, and constant tasting throughout preparation has got me to a point where I can wing it like this and pull it off. Happy happy happy! For those who’ve read this far, thank you for indulging me. 🙂 I love writing and thinking about cooking almost as much as I like doing it. Having developed such a profound love of this banal activity has been one of the most rewarding choices I have made in my life. Thank you to all the eaters who provide me with the opportunity to indulge my passion.